In roughly 36 minutes, Ross and Heiner challenge each other on a number of different issues, including the teachings of Vatican II, continuity vs. rupture, Francis' claim to the Papacy, the benefit of the doubt, the nature of the Church, the question of authority, and more. Stephen Heiner is the founder of True Restoration, a sedevacantist media apostolate. True Restoration produces and publishes radio shows, video interviews, and books relating to topics of interest for traditional Catholics, thus helping to educate people in the Catholic Faith and its unique take on every aspect of our world. [UPDATE 15-JUN-2018: Vatican Spokesman explains why Parolin attended Bilderberg] This is a difficult topic to write about without having half of all readers immediately run away screaming, "conspiracy nuts!" We have no choice but to take this risk because the issue is too serious to ignore, and facts are facts. (For a sobering reality check on what sundry Popes have said about certain conspiracies against the Catholic Church, please see here.) The official web site of the notorious globalist Bilderberg Conference has released its participants list for this year's meeting, which is scheduled for June 7-10 and will be held at the NH Lingotto hotel in Turin, Italy. Until recently, the attendee lists for these annual top-secret meetings of the world's elite were always kept highly confidential, and it was only through leaked copies that the outside world could be informed of who was attending (aside from reporters of alternative media trying to identify individuals as they made their way to the conference, as can be seen here, for example [you'll want to mute the video due to use of profanity]). This year, the official participants list includes a name of particular significance: "Cardinal" Pietro Parolin of Vatican City. Parolin is the Vatican Secretary of State, which means he is "Pope" Francis' right-hand man. He is second only to Francis himself in terms of importance and influence in the Vatican II Sect. This is the first time, as far as we know, that a member of the Modernist pseudo-Catholic church has been invited to participate in a Bilderberg meeting. "...[S]ome say [Parolin] will deliver a secret message written by Pope Francis to his minions", writes Leo Zagami in a post covering this news story. Those who are not familiar with the topic of the Bilderbergers may not grasp how significant Parolin's attendance is, so a little background is in order. Vatican Fake News Fiasco: Now a Third Omitted Paragraph from Benedict XVI's Letter appears! [UPDATE: 21-MAR-2018: The Vatican's fake news director, Dario Viganò, has resigned] No doubt you've heard about "Lettergate" by now, the Vatican's clumsy attempt to market a confidential letter from Benedict XVI as an endorsement of the theology of "Pope" Francis. We briefly touched upon it in our post on the state of the Vatican II Sect after five years of "Pope Francis". In a nutshell: At a Vatican press conference on Mar. 12, 2018, the Prefect of the Secretariat for Communications, "Mgr." Dario Viganò, presented excerpts from a letter Benedict XVI had written to him apparently endorsing and praising the recently-published 11-volume work written by various authors about the (so-called) theology of "Pope" Francis. This news was then distributed through Vatican Media's web site, and a brief video presentation was also created. But it has since come to light that the text the Vatican's press office handed out was not the full text of the letter (although Vigano did read it out loud during the presentation), and that the omitted portions change the context quite a bit, and that the photo was intentionally staged and doctored in such a way as to hide unflattering content. two of the three omitted paragraphs Vigano read aloud at the Mar. 12 press conference -- why were they appropriate for people to hear but not to read about? Was the letter truly written by Benedict XVI? If it was, do the contents really reflect his thoughts? Could it be that Vigano & Co. have acted so clumsily precisely because they want to create the impression that there is truly a rupture between Benedict and Francis that the Vatican is ostensibly trying to smooth over? Could all this be part of an effort to create an internal Novus Ordo schism, with the ultimate goal of ensuring that those who dislike Francis and love Benedict will be encouraged to remain in the Vatican II Sect but simply attach themselves to Benedict rather than Francis? It was Mar. 13, 2013, when Mr. Bergoglio stepped out on the balcony of St. Peter's Basilica, clad entirely in white, without the customary red stole for the urbi et orbi blessing, looking at a cheering crowd. His initial words of buona sera — “good evening” — and his subsequent request for the people gathered in St. Peter’s Square to pray over him before he would “bless” them, were an ominous harbinger of what was to come. Remember? Are people giving up Francis for Lent? More information on the possibility, significance, and effects of an intra-Novus-Ordo schism can be found here. Folks, after five years of Francis, it's obvious that the wheels are coming off. The Novus Ordo Sect is approaching its own demise at rapid speed, and that is a good thing, because once the "operation of error" itself has been removed (cf. 2 Thess 2), surely there is nothing that will prevent the true Catholic Church from rising gloriously once more, with a true Pope, recognized as such by the whole world. Do not doubt it in the least, for just as "God is able of these stones to raise up children to Abraham" (Mt 3:9), so can and will He put a real Pope back on the Chair of St. Peter and restore the Roman Catholic Church to her former glory, in imitation of her Divine Lord, who rose gloriously from the grave but not until after His humiliation (see Mk 9:11; Lk 24:25-26). Therefore, "be not faithless, but believing" (Jn 20:27). Finally, we should not fail to congratulate the pseudo-pontiff on five years of chaos. Never before has a single man been able to make the case for Sedevacantism as compellingly as he has. Thank you, Jorge! Ad multos annos! Lawler's book contains eight chapters in total: "The Surprise Election"; "The Francis Effect"; "Stalled Reforms"; "Manipulating the Synod"; "The Unanswered Question"; "The Document and the Dubia"; "Allies and Enemies"; and "Tradition in the Balance". The following excerpt is a portion from Chapter 3 ("Stalled Reforms"), pp. 69-71, which we are making available here with the kind permission of the publisher, Regnery Gateway. In case you missed our initial announcement on December 31: Our popular TRADCAST podcast program is back with a new, full-length episode! As always, it is loaded with real traditional Catholicism, hard-hitting refutations of various errors, razor-sharp analysis, and a touch of humor. TRADCAST 020 covers a number of different topics, including a very quick year-in-review of the worst and craziest stories of 2017. We also expose some anti-Catholic howlers presented by Louie Verrecchio in an interview that appeared on the "Saturday Night Trad" podcast show of Catholic Kulchur, and we slam "Pope" Francis for rejecting the truth that we must go to Mass in order to give God what we owe Him. In addition, we look at the infallibility of the canonization of saints and refute Chris Ferrara's latest attempt to spin his way out of the obvious conclusion that Francis cannot be Pope if he declares Paul VI a saint. A response to Dr. John Joy's article on the Authentic Magisterium at One Peter Five is also part of TRADCAST 020. Various objections to Sedevacantism are addressed as well. As always, the podcast is interlaced with important insights, quotes from solid Catholic sources, and some much-needed humor! The total run time of TRADCAST 020 is just over 1 hour. Here’s an idea: Why not host a TRADCAST party at your home and invite family, friends, or neighbors over to discuss the show? You can also listen to older shows using our complete episodes list; or listen to a sermon or an apologetics/catechism class with your friends and family as well. This makes for great conversation -- much more important than football or politics! -- and will open people’s eyes about Francis and the Novus Ordo Sect! It’s one way you can do evangelization the easy way. In any case, don’t miss this TRADCAST and spread the word! You can listen free of charge by playing the YouTube video above, or you can go to our TRADCAST 020 page, where you will find all the information you need for this show, including links to all the articles, books, blog posts, etc., mentioned in the podcast, and where you will also find ways to download this episode to your computer and sign up to be notified of new episodes by email. "I said, 'Turn off the TRADCAST!'" Novus Ordo Watch, "Paul VI: What you need to know about the man who claimed to be the Pope from 1963-1978"
Those who are now longing for the "good old days" of Benedict XVI and John Paul II may want to hold off on that, though. Remember? Alas, we have come full circle. Just as our Blessed Lord was once spurned by His own (see Jn 5:37-40), so it is once again today: He is rejected by those who (falsely) claim to be His legitimate representatives and ambassadors (cf. 2 Cor 5:20), those who have the duty of witnessing to Him: "He came unto his own, and his own received him not" (Jn 1:11). What more evidence is needed to demonstrate that the Novus Ordo Sect is not the Roman Catholic Church of Pope Pius XII and his predecessors but rather an apostate religion that mocks and denies Jesus Christ? "Cardinal" Koch and his friends are busy lighting candles commemorating something that has long been fulfilled in the Eternal Covenant sealed with the Precious Blood of Jesus Christ, who is "the true light, which enlighteneth every man that cometh into this world" (Jn 1:9). By doing so, the Vatican apostates are denying the very Lord who bought them: "But there were also false prophets among the people, even as there shall be among you lying teachers, who shall bring in sects of perdition, and deny the Lord who bought them: bringing upon themselves swift destruction" (2 Peter 2:1). By the way, can you imagine the Chief Rabbis of Jerusalem throwing a Christmas party? The Catholic vs. podcast is a Novus Ordo podcast produced and hosted by David Mary Andrew Ross. The host, who is a convert to the Vatican II Church from atheism (2009), interviews guests who have a religious position different from his own. The format is informal and conversational, and the idea is to generate light rather than heat. On Sep. 30, 2017, in an episode entitled Catholic vs. Catholic, the host interviewed sedevacantist Stephen Heiner, an episode we featured on this blog. The audio is still available and can be listened to here. The official web site of the notorious globalist Bilderberg Conference has released its participants list for this year’s meeting, which is scheduled for June 7-10 and will be held at the NH Lingotto hotel in Turin, Italy. Today, April 23, is the day of the official release of the second and expanded edition of The Dictator Pope, a very frank and therefore highly unflattering look at the person of Jorge Bergoglio, especially in his stage act as “Pope Francis”. The author, historian Henry J. A. Sire, is not a sedevacantist and so cannot be accused of bias in our favor. What I am most pleased at is that the book was immediately noticed in high ecclesiastical circles. The question that inevitably arises is: What in the world is this? Four Poké Balls decorating a Christmas tree? Billiard balls caught in a ventilator? …Or what?? Like with many other Novus Ordo logos and emblems, this image too is just screaming spiritual maturity and sophisticated theology, isn’t it? The author of the explosive book The Dictator Pope: The Inside Story of the Francis Papacy has now been revealed: It is historian Henry J. A. Sire. The disclosure is not a “leak” or the fruit of an investigation; rather, the author chose to reveal his own name for the forthcoming second edition of his book, this time to be published in a print edition by Regnery Publishing. Sire had hitherto used the pen name Marcantonio Colonna but had said from the beginning that he knew he would eventually be unmasked anyway. Vatican Fake News Fiasco: Now a Third Omitted Paragraph from Benedict XVI’s Letter appears! No doubt you’ve heard about “Lettergate” by now, the Vatican’s clumsy attempt to market a confidential letter from Benedict XVI as an endorsement of the theology of “Pope” Francis. We briefly touched upon it in our post on the state of the Vatican II Sect after five years of “Pope Francis”. In a nutshell: At a Vatican press conference on Mar. 12, 2018, the Prefect of the Secretariat for Communications, “Mgr.” Dario Viganò, presented excerpts from a letter Benedict XVI had written to him apparently endorsing and praising the recently-published 11-volume work written by various authors about the (so-called) theology of “Pope” Francis. Today is the day a new book against Francis is hitting the shelves in the United States: Lost Shepherd: How Pope Francis is Misleading His Flock. It was written by Philip F. Lawler, who is a conservative Novus Ordo journalist, author, and commentator who will no longer remain silent about the damage the “Pope” has been inflicting on souls under the guise of Catholicism. Lawler currently publishes a popular column at Catholic Culture, where he has been venting some of his frustration about the man he, despite all, still believes to be a valid Pope of the Catholic Church. It is amazing how quickly doctrine develops in the Novus Ordo Sect. Consider Francis’ blasphemous exhortation Amoris Laetitia, for example: Released on Apr. 8, 2016, the document is not even two years old yet, and already an Italian (im)moral theologian is using its teaching to justify more sins against the Sixth Commandment — that’s the one with “irregular situations” and such. 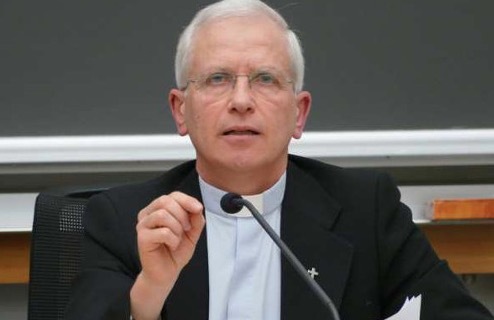 Responsible parenthood can obligate a married couple to use artificial birth control, a recently appointed member of the Pontifical Academy for Life has argued, basing his theory on Pope Francis’ apostolic exhortation on the family, Amoris Laetitia. In case you missed our initial announcement on December 31: Our popular TRADCAST podcast program is back with a new, full-length episode! As always, it is loaded with real traditional Catholicism, hard-hitting refutations of various errors, razor-sharp analysis, and a touch of humor. TRADCAST 020 covers a number of different topics, including a very quick year-in-review of the worst and craziest stories of 2017. So far, so good. But now it has come to light that the company the Vatican hired to do all this work — both the original design and setup and the ongoing development — is one of the most openly supportive of sexual perversion out there. Nothing says ‘witnessing to Christ and the Gospel’ quite like celebrating the religion that officially denies Him, right on Vatican property! Last week’s [interreligious] Vatican meetings concluded with a happy, inclusive moment of a celebration of Hannukah [sic].